Dash is still moping over the disappearance of Plucky. Then she comes up with an idea. She decides to let herself be captured by the humans. That way she will be able to find him. Owl, meanwhile, mourns the loss of Farthing Wood, commenting upon how only the one tree remains; old and tatty like her. 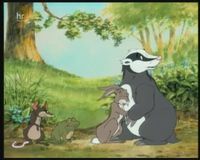 She quickly tries to convince herself it is not Farthing Wood, as the lovesick rook continues to bother her. In an attempt to lose him, she flies into the attic of a house through an open window. 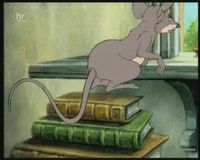 Soon, two rats pass her. They are leaving the attack to travel to a park they have heard of; a park where rats are taking over. As they leave, however, they knock the window shut, trapping Owl in the attic, with only a cat for company. Back at White Deer Park, Dash is surprised by the fact that the humans would not take her. 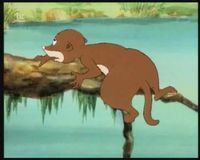 Instead, the animals persuade a reluctant Whistler to follow the van and find out where all the animals are being taken. He eventually finds Plucky alive and well at a new animal sanctuary. Plucky is very settled in the new park and has even become the chief fox there. However there are other animals who desperately want to be reunited with their families. 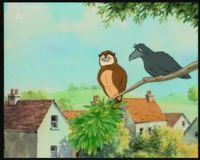 At the housing estate, the rook tries in vain to free Owl from the attic, as she watches on with the cat. Eventually she escapes when the humans enter the attic, after some frantic flying around the house. Outside, the rook is being comforted by his real mate. As Owl settles on the tree, she realises it is the Great Beech, finally accepting that this is her old home.